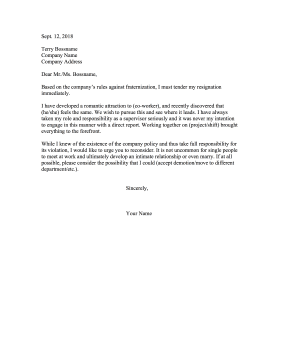 This resignation letter can be used when a supervisor has violated a fraternization rule by dating a coworker. Based on the company's rules against fraternization, I must tender my resignation immediately. I have developed a romantic attraction to (co-worker), and recently discovered that (he/she) feels the same. We wish to pursue this and see where it leads. I have always taken my role and responsibility as a supervisor seriously and it was never my intention to engage in this manner with a direct report. Working together on (project/shift) brought everything to the forefront. While I knew of the existence of the company policy and thus take full responsibility for its violation, I would like to urge you to reconsider. It is not uncommon for single people to meet at work and ultimately develop an intimate relationship or even marry. If at all possible, please consider the possibility that I could (accept demotion/move to different department/etc. ).